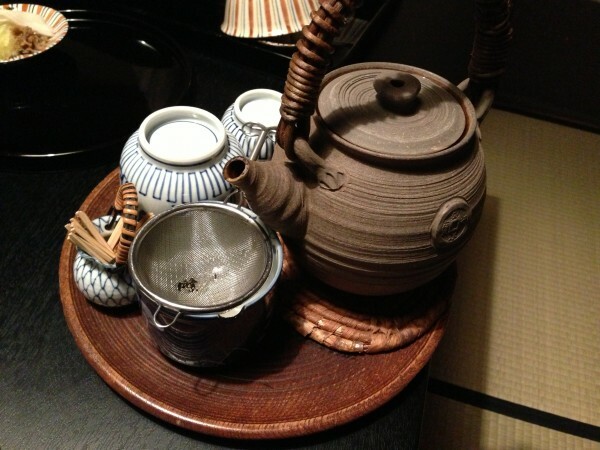 For those that are regular readers of the blog, you’ll know that I went to Japan in December 2012. I’ve been so busy, I haven’t yet been able to blog everything I’ve eaten there yet, so you’ll have to be patient with me. Expect a sprinkling of posts from Japan here and there for the next couple months. Here’s one I can’t wait to share: my first experience at a Michelin starred restaurant. 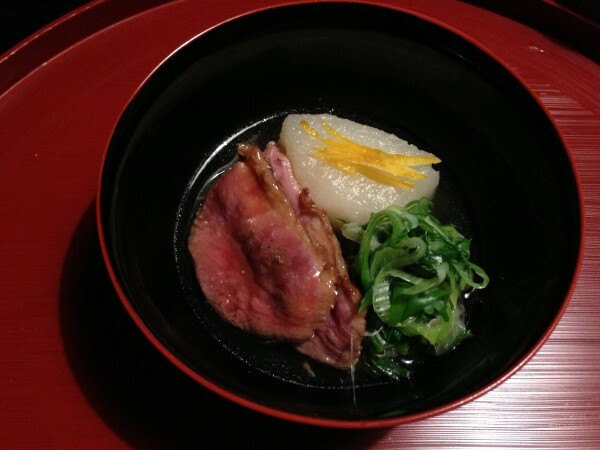 Hyotei is a three star Michelin restaurant located in Kyoto. 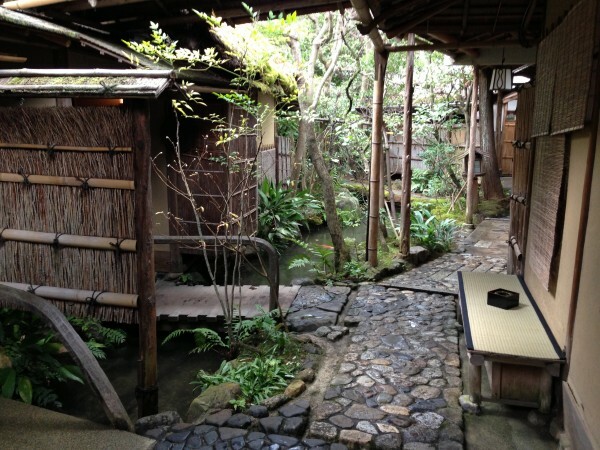 Steeped in history, the establishment is over 300 years old and used to serve as a teahouse for pilgrims and travellers on their way to the Nanzenji Temple. 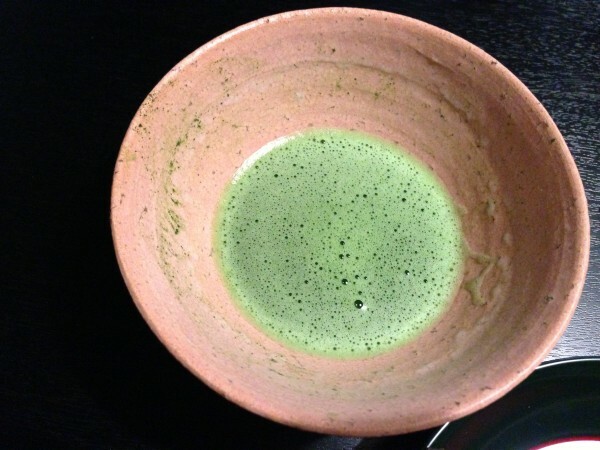 The aesthetic of the place has remained intact – today, one part of the restaurants serves traditional Kyoto cuisine in the form of bento box lunches while the other is composed of several tea houses where diners are privy to an exclusive kaiseki menu. 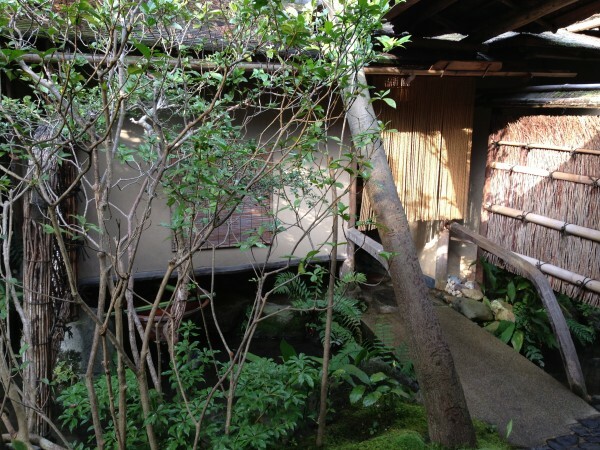 As soon as we entered the restaurant, we were greeted by a woman dressed in a traditional Japanese kimono who led us through the outdoor courtyard and towards our own private tea house. 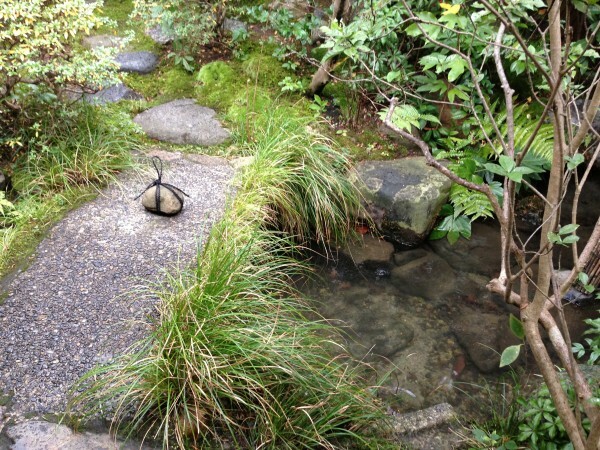 Walking down the cobblestone path, we took in the beautiful zen gardens, the calm water ponds and carefully tended bushes and shrubbery. Exuding a sort of peaceful serenity, the environment felt unreal – as if we were in another time. Upon arriving at our tea house, we slipped off our shoes and stepped into our dining room made up of tatami mats, sliding doors and our own view of the garden. We almost whispered the entire time to respect the quiet intimacy provided by the space. After several minutes, our server returned, knelt at the door, slid it open and brought our first course along with a recommended sake. Two beautiful ceramic figures sat on the tray, almost like little presents waiting to be opened. The first held a handful of sweet pickled daikon: the pink, orange and white colors meshed together to create a pretty bouquet. 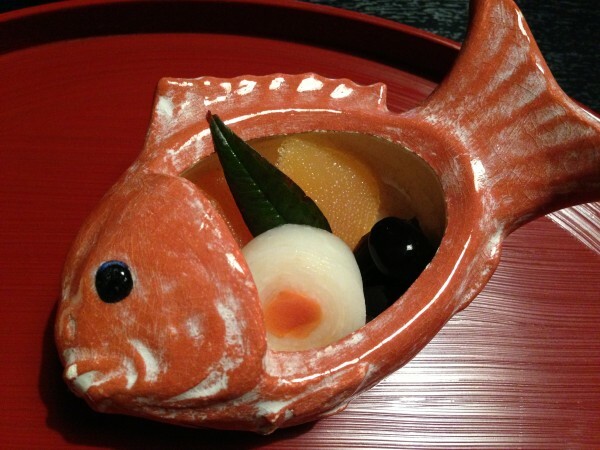 The second was shaped in the form of a small fish – in it were a trio of black beans, herring roe and pickled daikon. The black beans were sweet and the roe was unlike any I’ve ever had prior to this trip – tiny little explosions went off in the mouth as you ate it. Dense and firm, there was less moisture in it than you would expect. Nice crunch to it too. 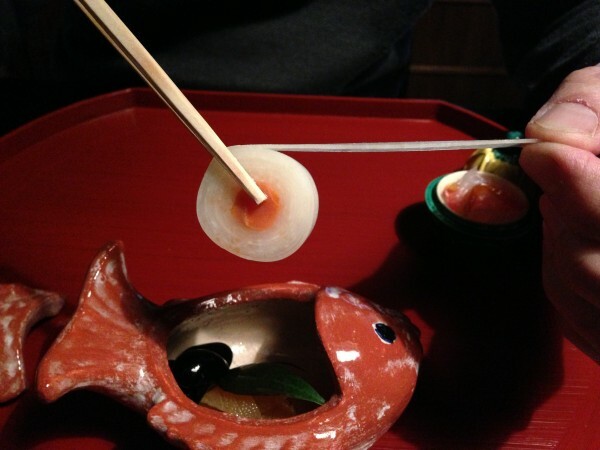 The daikon was sliced unbelievably thin and then expertly rolled up into a tight circular ball. We unravelled it to see how long it stretched; the technique was impressive. Clearing away our dishes, we were allowed us a moment’s pause before the next dish was brought in. 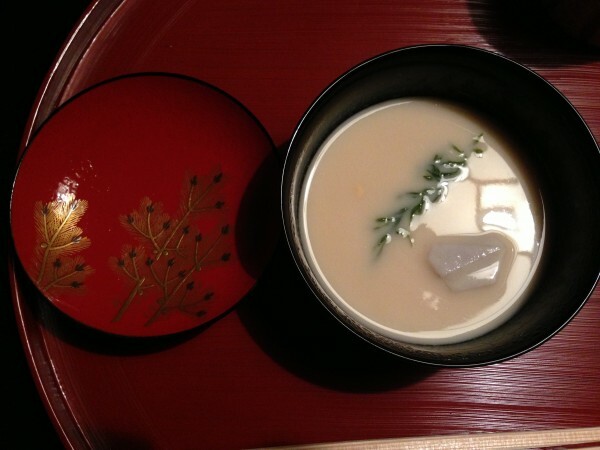 Opening up the top revealed a thick, white miso soup. Milky in both color and texture, the flavours were unexpectedly complex. I don’t think I’ve ever tasted anything like it before. A special mochi hid inside, warm and gooey, completely viscous to the touch. Served with a bit of wasabi, there was a nice hit of spice that came along with every bite. 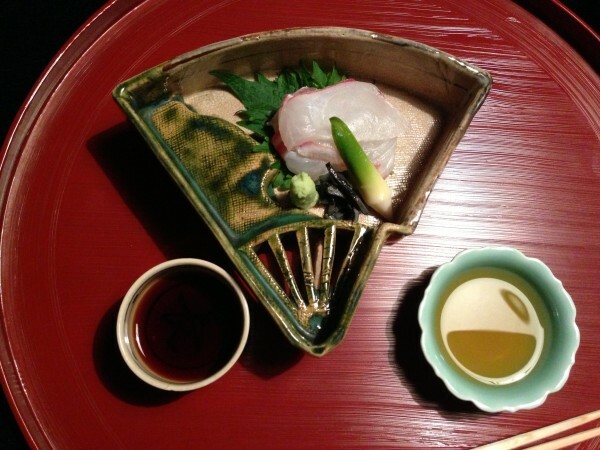 Then, a plate of delicate red snapper sashimi arrived, accompanied by two different sauces: shoyu and tomato based soya sauce. Having eaten sashimi pretty much every night at this point, something seemed a little bit off with the sashimi we got at Hyotei that day. It didn’t taste up to par, being slightly chewy. Some of it was unfortunately left on the plate, unfinished. 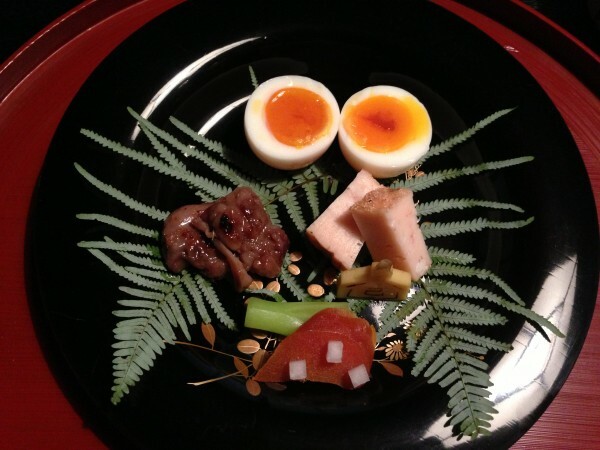 The boiled egg, sliced and placed symmetrically on the plate was presented with duck, two shrimp cakes and a piece of karasumi. 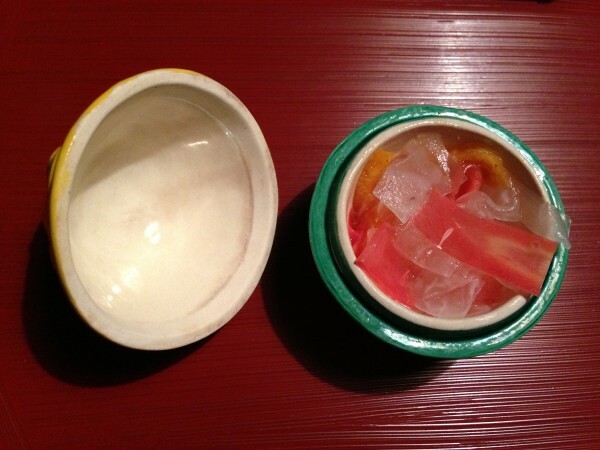 Karasumi is salted and dried mullet roe with a taste similar to caviar but with a saltier, more ocean-y flavor to it. It is chewy and dense – more of an acquired taste then anything I would say. The light, clear broth contained two slices of duck, a thick chunk of soft daikon, several strips of lemon zest for a punch of flavor and a pinch of chopped scallions. Simple, clean flavours really made this dish stand out for me. The managato fish was sliced horizontally to give a slightly larger portion. Grilled with a bit of miso and charred to perfection, the meat was flaky, tender and done just right. 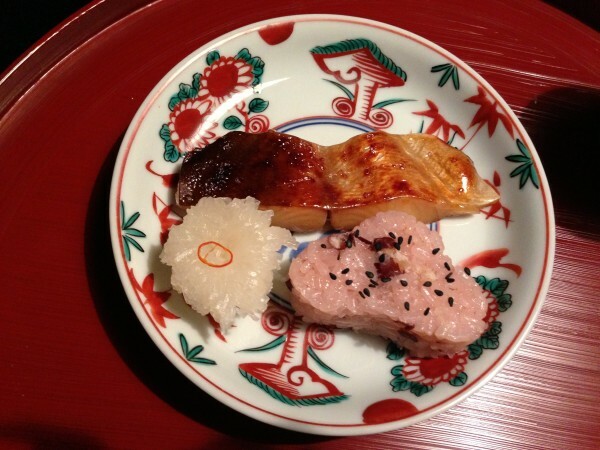 The vinegar soaked daikon was made to look like a little sea vegetable with a little toupee and the red bean rice was shaped into a lopsided heart. Or is that just me trying to be artistic? In any case, it was very cute. The tea signified the last segment of our meal. Another clear soup came with a hot fish ball, lemon zest, carrot. Light and easy. Perfect rice accompanied by a combination of different tsuke – pickled vegetables and fish ensured that we were full at this point in the meal. The dessert was simple: nothing more and nothing less. 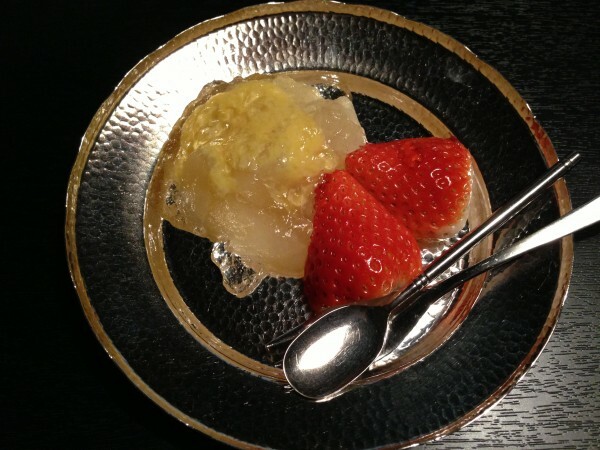 Fresh strawberries and a sweet jelly – both refreshing and delicious. 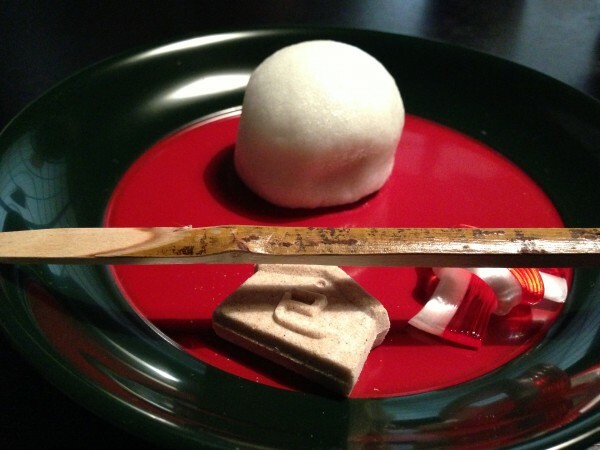 New Year’s mochi, a hard biscuit and a minty candy in the shape of a ribbon. For me, the biscuit was particularly interesting, with a dry, crumbly texture of something like sandpaper. Sounds weird, I know. Finishing off the meal with a bit of bitter matcha green tea, we sat back and enjoyed the view for a while little longer. Our entire meal was themed around the New Year. 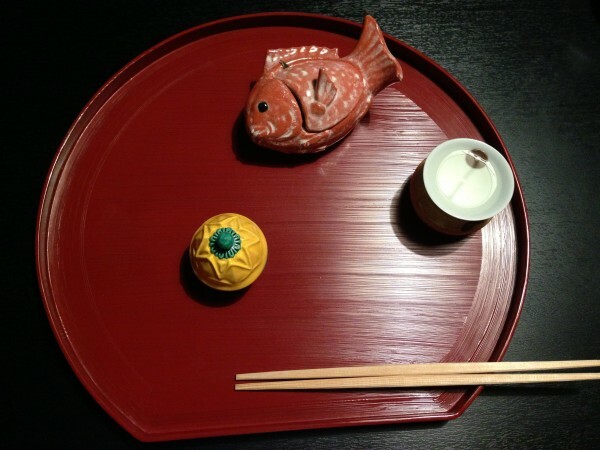 Each dish had a special meaning and represented good wishes for prosperity, health and longevity for the coming year. Every ingredient was chosen with absolute care – there were few mistakes. Hyotei understands aethetics, presentation, service, quality, mystery, intrigue and beauty. This was apparent throughout the meal, the setting in which it was served and the level of care and expertise our servers provided us with. These are the tangible elements that diners can readily engage and interact with – what may seem a bit more elusive and difficult to grasp is the weight that history, tradition and culture has on the depth of the experience that you may or may not have here. 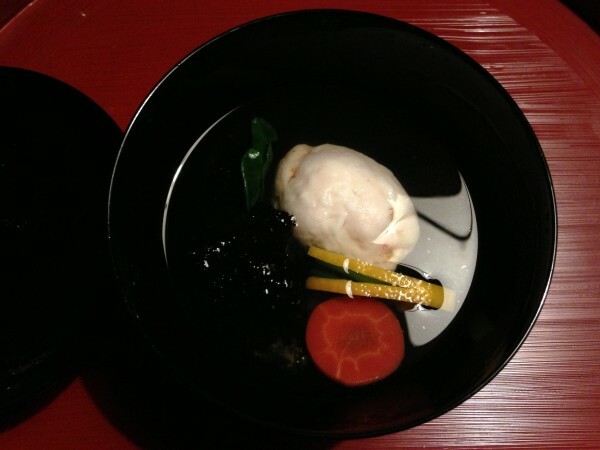 To many foreigners (myself included), Hyotei provides an unparalleled dining experience – one that would be close to impossible anywhere in the West. While this may all be true, I can’t help but feel like the prices did not match the kind of food we ate that day. For 27,000 yen or about $300 USD per person for lunch, it seemed a bit steep. 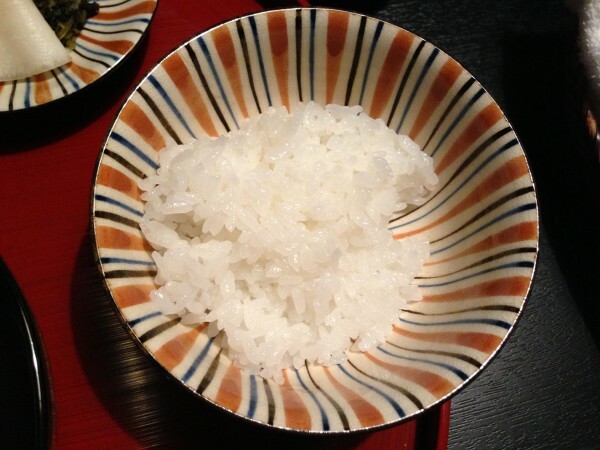 The food here may seem reserved, conservative and perhaps even lacking in boldness of flavor – maybe these are elements of the traditional Japanese cuisine I have yet to learn how to fully appreciate. Relative to the asking price, perhaps it may not be worth it. 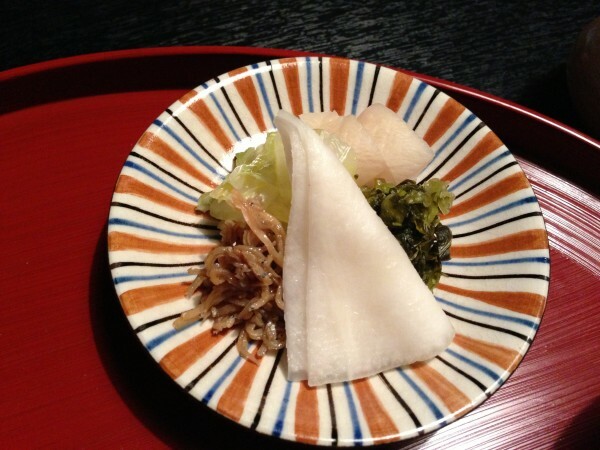 Tags: Daikon, Duck, Hyotei, Japan, Japanese, Kyoto, Michelin, Michelin Three Stars, Miso, New Year, Sashimi, Traditional.